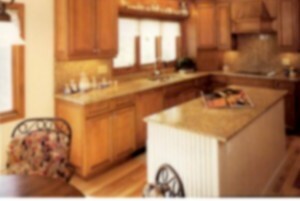 We use a variety of products including laminate, granite and quartz for kitchen countertops. Laminate is a practical, cost effective option for your new countertop. There are many colours, patterns, finishes and edge profiles to choose from. In recent years there have been large improvements in laminate’s overall esthetics. For example, the FX series laminates are made using actual high resolution photographs of granite that are then printed onto laminate. With the FX series, you get the look of a stone countertop at a fraction of the cost. If you want a low maintenance surface, quartz is the product for you. Quartz is granite that has been crushed and re-formed into a super hard medium. The quartz is produced according to colour blocks and standards for colour consistency. Quartz is less porous than granite, therefore sealing is not required. This makes quartz a low maintenance and beautiful product that people love! Do you love the look of natural stone? If so, granite is the right choice for you. Granite has the waves, patterns and colour variation of natural stone. Some types of granite require sealing as it can be more porous than other surfaces due to the stone’s natural fissures. You will select your own slab of granite since each slab will have variation in pattern and colour.